Can you play as the Guardians of the Galaxy? Yes. LEGO Marvel Superheroes 2 includes a massive roster of both good and villainous characters from across the Marvel universe including Drax, Rocket, Groot, Star-Lord and Gamora among many others from the Guardians of the Galaxy worlds. What new features have been introduced in this edition? As well as the introduction of a new hub world called Chronopolis, LEGO Marvel Superheroes 2 also features a new four-player competitive battling mode in which players can fight against each other in arenas. Does the game feature a multiplayer mode? Yes. In this edition of the series, players will be able to battle each other in groups of up to four people. The bouts will take place in arenas and feature a co-operative gameplay mode. What is the plot of LEGO Marvel Superheroes 2? 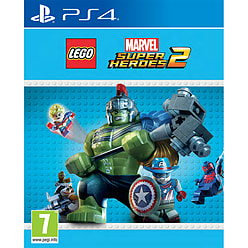 LEGO Marvel Superheroes 2 features both good and bad characters from across the Marvel universe in a battle against Kang the Conqueror. Introduced in this instalment is the new hub world of Chronopolis.